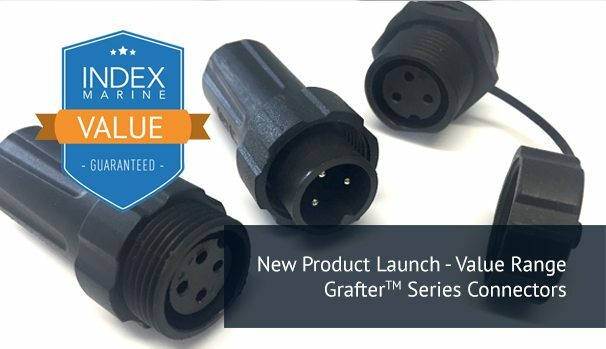 Index Marine announce the first products in its new Value product line – the ‘Grafter’ series of waterproof connectors. Recognising that many of its traditional marine market customers are looking for the most cost-effective wiring connector solutions for working boats and out-of-view installations, Index Marine’s new family of plugs and sockets maintain IP68 environmental protection, while reducing the size and cost compared with the Bulgin Buccaneer series which the company also sells. Rated at 250V and up to 12A, the ‘Grafter’ connector range is ideally suited to Index Marine’s traditional marine market as well as other vehicles, industrial power, lighting and general purpose connectivity applications. Manufactured in a black plastic finish, inline and deck-mount variants with 2, 3, 4, 5 and 6 pins are available. The inline connectors are 58mm long and maximum 26mm in diameter, and the deck-mounted sockets are 35mm long (including waterproof cap) and 31mm in diameter. Leads are solder-in, and the plug housing screws onto the socket with waterproof seals maintaining environmental integrity. METSTRADE 2018 – Index Marine will be exhibiting!